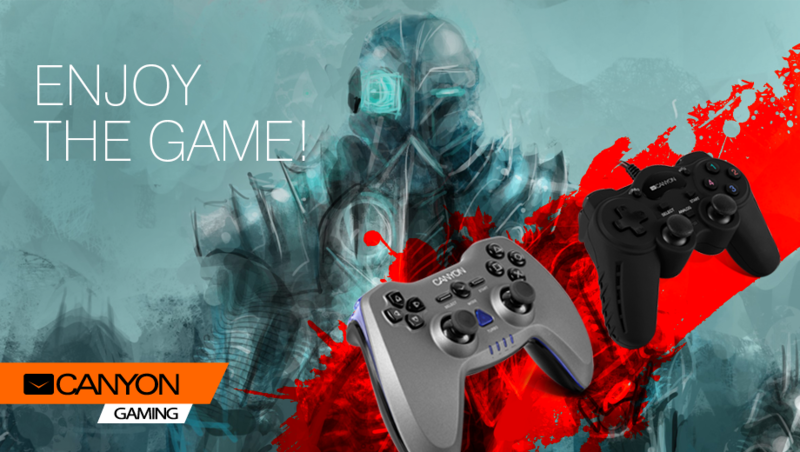 Sit back and enjoy the immersive gaming experience with the new gamepads by Canyon! Canyon brand has introduced this spring its two new “3-in-1” gaming controllers – wired CNS-GP4 and wireless CNS-GPW6. Due to built-in vibration motors of the new gamepads, you can feel the full presence in a world of your game by feeling every explosion, collision, and crash. A distinctive feature of wired gamepad CNS-GP4 is automatic shooting modes and double trigger – functions, which are easily installed on buttons. These features are indispensable in shooters and other dynamic games. In its turn, wireless controller CNS-GPW6 can work for over 8 hours on a distance of 10 meters and is equipped with Turbo Fire acceleration button for dynamic shooters as well. The comfortable surface of both gamepads, rubberized grip, classical form and standard button layout provide maximum comfort during extended gaming sessions. The gamepads are compatible with PC and most of the modern gaming consoles. Canyon Gaming is a series of qualitative mice, keyboards, gamepads and other PC accessories created for gamers. The devices are a perfect choice for those who like unique design and extended functionality for an affordable price.